We refer to a little patient's first visit as a "Happy Visit" and strive to make it...and all the visits that follow, happy ones! Here are some tips that will help make that special first visit and ALL of your child's dental visits to Lorne Park Dental, GREAT! 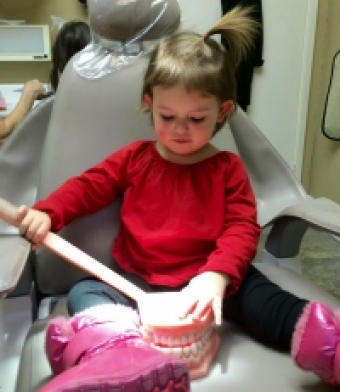 At Lorne Park Dental, we typically have children come to watch a parent or older sibling at around age 2 years. We always share tips about kid’s teeth with new Moms and Dads and offer to see their little one before age 2 if they have any concerns. Your child's first full "Happy Visit" appointment, as described below, will take place closer to age 3. It's great when children are able to see their older siblings having fun in our office. Please bring your little ones to their big brother's or sister's appointments. They get a kick out of seeing Mom or Dad sitting in the special chair with a bib on too. We'd be happy to give your child a ride in the chair with you or on their own. Reading children's books about 'Going to the Dentist' ahead of time can be very helpful. We have a selection of books in our reception area that you and your child are welcome to read. Let your child know that we are excited to meet them and their teeth. You may want to tell your son or daughter that we will be counting their teeth...We'll do a 'Show and Tell' and explain the rest in the office. Consider a morning appointment and bring your child to see us when they are the most alert and comfortable, not sleepy or hungry. Always use positive body language about dentistry in front of your child. Avoid using scary words like 'hurt' and ‘pain'. Let us know in advance if your child has any specific needs...Do they have physical limitations or are they especially sensitive to light, sound or tastes? Let us know if you have any specific concerns or if your child is experiencing any discomfort in their mouth. Plan to arrive a few minutes early so that your child has time to acclimatize his or herself to the office and enjoy our children's books and toys. One of our team will meet you in the reception area and get to know your child a little before you move together through the office into one of our dental treatment rooms. We love introducing children to our practice and showing them around! That first ride in our dental chair is a special thing. Children give us a big smile when they go up...up...up..like a rocket. We do bring them back down again eventually and then we recline the chair too. Getting to wear a bib like Mom or Dad or big brother or sister makes children feel so grown up. We provide sunglasses so that the bright dental light doesn't bother little eyes. If your child has a favourite pair of sunglasses that fit them just right, bring them along. We like to show children a few of the "toys" that we get to play with everyday. We use fun language such as: tooth counter (cavity checking instrument), tooth dryer (air syringe) tooth washer (water syringe), Mr. Thirsty or Mr. Slurpy (saliva suction tube), tooth sparkler (polisher), sparkle paste (toothpaste), sugar bugs and plaque germs (plaque). Children love to know how many teeth they have and they seem to remember that number from visit to visit. We're sure to count them up every time. If helpful, we have televisions in our dental treatment rooms that your child can watch while we are wiping those sugar bugs away. Here's a cute video to have your child watch before their dental visit...A hippo modelling good dental visit behaviour by keeping his mouth wide open as his handler brushes his teeth. Kids love this! Our dentists, Dr. Rosanna Fasciani and Dr. Malgosia DeAngelis, and our Registered Dental Hygienists look forward to meeting your children. You can expect a thorough examination/consultation. Some of the things that we consider are: which teeth are present or absent; loose teeth; any malformation or crowding of the teeth; the spacing between the teeth; how the back and front teeth fit together (if there are any dental crossbites, open bites or excessive over bites); a dentist cavity check (which may include x-rays if prescribed by our dentists); any oral habits, such as: thumb sucking, finger sucking/biting, lip biting, nail biting, mouth breathing, teeth grinding, tongue thrusting, etc. and the effect that the habit may be having on the teeth and development of the mouth; diet as it relates to dental cavities and which dental products are right for your child. We will show you and your child where we see any plaque (oral biofilm) or tartar (calculus) deposits and provide personalized oral hygiene instruction, including tips on how Mom and Dad can help. If your child permits it, we will scale away these deposits and "sparkle" your child's teeth. What if My Child is Apprehensive? We cater to hesitant children and take the time and care to be sensitive to their needs. Our little patients trust us. We are always honest and never try to fool them. We 'inform and explain' before we 'do'. Your child will know when we are about to touch their lips or teeth with a gloved hand and why we are wearing a mask. We want to set our young patients up for a lifetime of good oral health and positive dental experiences! p.s...If your child has a special stuffed animal friend, bring it for a check up too! Our happy little patients smile proudly for a personalized "Happy Visit Certificate" photo at the end of their First Dental Visit. We hear there are lots of smiles too when they receive it in the mail. Of course, on leaving our office, children look so proud and happy holding their new toothbrush and a prize from our prize basket. They did it...They had their First Dental Visit! We tell them to keep smiling and come and see us again when they are about half a year older! WE LOVE KIDS AND KIDS LOVE US!